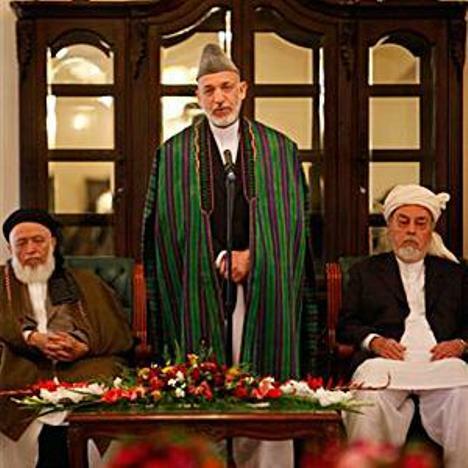 October 08, 2010 (KATAKAMI) — Afghan President Hamid Karzai used the anniversary of the start of the war in Afghanistan to open the inaugural session of a peace council appointed to help reconcile with the Taliban and other militant groups. President Karzai offered peace to the Taliban nine years to the day after U.S.-led forces began their effort to topple the group’s government in Kabul. Mr. Karzai opened the 70-member council meeting. The Afghan leader said he hoped the High Council for Peace will make the desire of peace and stability a reality for the nation. He said Afghanistan’s reconstruction and development are linked to peace and stability. The council includes former Taliban officials as well as past Afghan presidents, civilian and religious leaders. President Karzai made a special appeal to members of the Taliban in their main language, Pashto. He called again on opposition forces, the Taliban and any Afghan citizen inside or outside of the country to use the opportunity to forge peace. The U.S. government has expressed support for Mr. Karzai’s long-standing efforts to negotiate peace with the Taliban. For months, there have been scattered reports that the Karzai administration has been involved in secret talks with the militant group. But the Taliban leadership officially has dismissed the possibility of reconciliation until foreign forces leave the country. Afghan political analyst Wadir Sapai says he believes that the Taliban will accept a timeline for a coalition withdrawal only if the Afghan government meets its other basic demands, which include government recognition of the Taliban as a legitimate political group with sovereignty within its regional strongholds. Sapai says the Taliban inadvertently finds itself with allies in the current Afghan government, who are echoing its call for changes to the country’s constitution. “Even the opposition of the present government also wants this amendment, which would be a parliamentary regime with a prime minister and limited authorities for the president,” he said. Sapai says that a lack of trust in the Afghan government contributes to the belief that Afghanistan has lost more than it has gained after nine years of war. This year has been the deadliest of the war, with more than 560 foreign troops killed. More than 2,000 foreign troops have died since 2001. As coalition and Afghan forces push deeper into Taliban-controlled territory in the south, analysts warn that the number of causalities will increase. Pressure is building on Pakistan to escalate the fight against militants on its soil, especially since the release of more than 90,000 leaked U.S. military documents posted Sunday on the web by WikiLeaks. The trove of U.S. intelligence reports alleged close connections between Pakistan’s intelligence agency and Taliban militants fighting Afghan and NATO troops in Afghanistan. Pakistan called the accusations malicious and unsubstantiated, but the push to persuade Pakistan to do more to eliminate Islamic extremists on its soil continues. In a wide-ranging news conference, Karzai said Afghanistan has deep ties with “our brothers” in Pakistan. He didn’t mention Pakistan by name, but Karzai said that while Afghanistan is working diplomatic channels to prevent nations from training, protecting and giving sanctuary to terrorists outside Afghanistan, only the international community has the capability of actually doing something about them. “The question is, why are they not doing it?” Karzai said. make progress against terrorist groups on Pakistani soil. “To be fair, the Pakistan government — they have taken action against these groups,” he said. Karzai told reporters he ordered his cabinet ministers to study the war papers, especially those that address Pakistan and civilian casualties in Afghanistan. He also said documents that disclosed the names of Afghans who have worked with the NATO-led force were “shocking” and “irresponsible”. Karzai also was asked about the Obama administration’s decision last week to target key leaders of the Afghan Taliban with new financial sanctions, a move that could complicate relations with Pakistan and the Karzai government’s efforts to try to talk with some insurgent factions. The action by the Treasury Department freezes the militants’ assets, bans travel and triggers an arms embargo against three financial kingpins, including a key member of the al Qaeda linked Haqqani network, which directs operations against US and coalition forces in Afghanistan from Pakistan. It follows similar action by the United Nations earlier this week, and it comes after calls from Gen. David Petraeus, the top military commander in Afghanistan, and Sen. Carl Levin, Democrat-Michigan, chairman of the Senate Armed Services Committee, for sanctions against Afghan insurgent commanders operating in Pakistan. Taken together, the US and UN sanctions prohibit any financial transactions of terrorist leaders in UN member countries, putting additional pressure on Pakistan to take broader actions against Taliban militants. US officials have urged Pakistan to crack down on the al Qaeda-linked Haqqani network, saying Islamabad’s reluctance to move into the group’s base in North Waziristan is hampering the Afghan war effort. Pakistan has moved cautiously, but has been slow at times to take on militants that Islamabad does not believe pose a direct threat. Pakistan has had historic relations with some of the Afghan insurgents, and analysts suggest Islamabad perceives them as useful allies in Afghanistan when international forces withdraw. Karzai did not comment directly on the new sanctions, saying they were decisions by the US and international community. He said only that Afghanistan did not and would not have a so-called “blacklist”. “We want to take a step toward the peace,” he said, adding that his government is reaching out to militants who want to lay down their weapons, sever ties with terrorists and embrace the Afghan government and its constitution. “Bullets firing from their guns are targeting their children, their property, their lives,” he said. Kabul, Afghanistan (CNN) — Afghanistan’s president has backed the selection of Gen. David Petraeus as the top NATO commander in Afghanistan, saying he is “experienced” and an “expert commander” with knowledge of his war-torn nation. President Hamid Karzai made the comments Saturday as he met Adm. Michael Mullen, chairman of the Joint Chiefs of Staff, a statement from Karzai’s office said. Later Saturday, Mullen flew to Islamabad to meet with Pakistani President Asif Ali Zardari. Gen. Ashfaq Parvez Kayani, Pakistan’s army chief, and U.S. Ambassador to Pakistan Anne W. Patterson also attended the meeting, which dealt with bilateral relations, the fight against militants, and regional security, a Pakistani government press release said. Mullen was in Afghanistan on a scheduled visit that took on new significance after Gen. Stanley McChrystal was removed from his position this week as commander of the Afghan war, a day after Rolling Stone magazine published critical comments about top White House officials by members of McChrystal’s staff. President Barack Obama nominated Petraeus, the head of U.S. Central Command and the architect of the surge strategy in Iraq, to take McChrystal’s place. According to the statement, Karzai told Mullen that McChrystal was an “excellent” military commander who worked to avoid civilian casualties, forge coordination between Afghan and international forces, and take “useful steps” in training, developing and equipping Afghan forces. 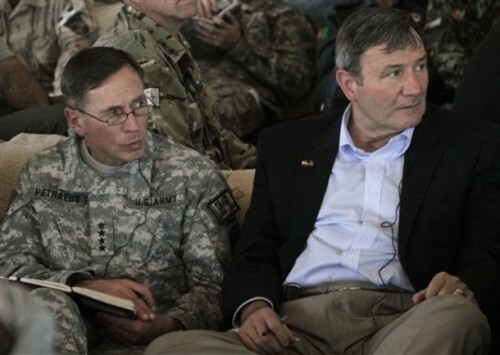 Mullen assured Karzai that Petraeus would continue these efforts. // Both men said that improving the fight against terror and pursuing a lasting peace “is our priority and more important than any time before,” the statement said. “Stunned” by the Rolling Stone article, Mullen had said he agreed with Obama’s decision to remove McChrystal. He had said that he planned to discuss the shift in leadership with Afghan military and civilian officials. An explosion near the foreign ministry in Kabul during Mullen’s visit Saturday caused a scare, but police said the blast was an accident and not an attack. Meanwhile, in Afghanistan, a Taliban commander disguised as a woman was shot dead Friday night in Afghanistan when he fired at troops, NATO’s International Security Assistance Force said. Authorities identified the man as Ghulam Sakhi, the senior Taliban commander in northern Logar province. ISAF said intelligence sources tracked Sakhi to a compound near the village of Qal-eh Saber in Pul-e ‘Alam district. After Afghan troops called for women and children to leave a building, Sakhi came out with the group, disguised in women’s attire. ISAF said he pulled out a pistol and a grenade and fired at troops. Afghan and coalition forces shot him and he dropped the grenade, which detonated and wounded a woman and two children. Authorities say Sakhi was involved in improvised explosive device attacks, ambushes and indirect fire attacks. He also kidnapped and killed a National Directorate of Security chief in Logar province. (KATAKAMI / VOA) President Hamid Karzai’s spokesman says the Afghan leader respects U.S. President Barack Obama’s decision to replace the U.S. and NATO commander in Afghanistan, General Stanley McChrystal. Waheed Omar told reporters Wednesday that President Karzai looks forward to working with McChrystal’s replacement, General David Petraeus, who has been the head of U.S. Central Command. President Obama announced McChrystal’s resignation Wednesday after the U.S. general was summoned to the White House to explain disparaging comments he made about the president and other top administration officials in an article published in Rolling Stone magazine. Earlier in the day, President Karzai and other Afghan officials pledged support for McChrystal, warning that his removal would hurt counter-insurgency efforts. Afghan Defense Ministry spokesman General Mohammad Zahir Azimi said there have been many positive changes since McChrystal took command, including a decrease in civilian casualties. Britain’s Prime Minister David Cameron (Centre R) walks with Afghan President Hamid Karzai, (Centre L) at the Presidential Palace in Kabul, on June 10, 2010, on his first visit to Afghanistan since taking office. Cameron said Thursday that Britain would send no more troops to Afghanistan, in a televised press conference with President Hamid Karzai in Kabul. Afghan President Hamid Karzai, center, shakes hands with British Prime Minister David Cameron prior to a meeting at the presidential palace in Kabul, Afghanistan, on Thursday, June 10, 2010. British Prime Minister David Cameron (L) talks with Afghan President Hamid Karzai during a meeting at the Presidential Palace in Kabul June 10, 2010. Cameron arrived in Afghanistan for talks with Karzai on Thursday, his first visit as prime minister to a country that his new coalition government has set as its top foreign policy priority. Britain’s Prime Minister David Cameron (L) attends a joint news conference with President Hamid Karzai at the Presidential Palace in Kabul, on June 10, 2010. Cameron said Thursday that Britain would send no more troops to Afghanistan, in a televised press conference with President Hamid Karzai in Kabul. Britain’s Prime Minister David Cameron arrives in Kabul to hold talks with President Hamid Karzai, on June 10, 2010, on his first visit to Afghanistan since taking office. Cameron said Thursday that Britain would send no more troops to Afghanistan, in a televised press conference with President Hamid Karzai in Kabul. (TELEGRAPH.CO.UK) The Prime Minister said that British and coalition forces should examine how to go “further and faster” in order to bring troops home sooner. He also promised to double the number of British bomb disposal teams in Afghanistan and announced extra aid to help the country build up its army, police and civil service in what he said was “the vital year” to make progress. Speaking as he met Hamid Karzai, the Afghan president, in Kabul, Mr Cameron said that the public in both Britain and America wanted to see “real progress this year”. He said that people in both countries had accepted that time was needed to see results from US President Barack Obama’s troop surge. But he said: “We should all the time be asking ‘Can we go further, can we go faster?’. However he ruled out sending further reinforcements. “The issue of more troops is not remotely on the UK agenda,” said the Prime Minister. “We have just had quite a significant uplift, not just in terms of UK troops but also of US troops. “In Helmand there are now over 20,000 US troops and 10,000 UK troops. Earlier Mr Cameron announced an additional £67 million to counter the threat from improvised explosive devices (IEDs), weeks after Colonel Bob Seddon, Britain’s senior bomb disposal officer, resigned his post after raising concerns for the welfare of his men. Speaking alongside Mr Karzai at his presidential palace, Mr Cameron said the number of British teams dealing with IEDs will be doubled. He also announced additional aid funding for Afghanistan to build up its army, police and civil service capacity in what he said was “the vital year” to make progress in stabilising the country. Describing relations between the two countries as “very, very important”, Mr Cameron said he regarded Afghanistan as Britain’s most important foreign policy and national security issue. Mr Cameron’s first major overseas trip since taking office is expected to form part of the new Government’s review of the mission in Afghanistan, which has lasted almost a decade and cost nearly 300 British lives. Since entering No 10, Mr Cameron has overseen a “stocktake” of Britain’s Afghan strategy, consulting even outspoken critics of the current Nato strategy of supporting Mr Karzai’s regime and training his police and army. So far, that review has not led to any significant change in Britain’s approach to Afghanistan, although government sources said the Coalition wants to play a more active role in shaping the international Afghan strategy. The early days of the Coalition have been also marked by some public confusion over Britain’s Afghan aims. Liam Fox, the defence secretary, has insisted the mission is about preventing regional instability and stopping al-Qaeda using Afghanistan as a base for terrorism, and not about the political development of a “13th century state”. By contrast, Andrew Mitchell, the development secretary, has said that economic, social and political progress are essential to British success in Afghanistan. Officials are privately concerned that UK influence in Afghanistan has been waning amid a surge in American troop numbers. Britain has around 10,000 troops in Afghanistan, making it the second largest contributor behind the US. A “surge” in American force levels will take US numbers in Afghanistan to 100,000. Confirming the growing American dominance of the Afghan mission, a US Marine Corps general recently took over command of international forces in Helmand province, where around 8,000 British troops are based. Some commanders have suggested that Britain should leave Helmand altogether and transfer its forces to Kandahar, where the next major Nato operation against the Taliban will soon begin. However, Dr Fox this week confirmed that the Government rejects any move from Helmand, where most British lives have been lost. Mr Cameron has previously spoken of a “timetable” for beginning the withdrawal of British forces from Afghanistan, though officials insist that any withdrawal will be based on the ability of the Afghan security forces to operate unaided. However, that “conditions-based” timetable may come under growing scrutiny in the months ahead. Barack Obama has indicated that he wants US numbers in Afghanistan to start falling by July 2011. With Nato allies including Canada also planning to reduce their forces in Afghanistan, Mr Cameron may soon come under increasing pressure to tell UK voters when British forces might leave the country. The growing British death toll is also likely to push Afghanistan up the political agenda. A total of 294 British personnel have died in Afghanistan since 2001, more than were lost in the wars in the Falklands or Iraq. The most recent British casualty was announced yesterday as Mr Cameron was flying to Afghanistan. Col Seddon, of the Royal Logistic Corps, has been responsible for tackling the growing threat to troops posed by Improvised Explosive Devices (IEDs) on the front line as the Army’s Principle Ammunition Technical Officer (PATIO). He has resigned his commission and is due to leave in January amid concerns that previous cuts have left his team overstretched and undermanned. Taliban fighters have successfully adopted roadside bomb tactics developed in Iraq making it the most deadly threat to British troops in Afghanistan. Earlier this year two bomb disposal experts received the George Cross, which ranks alongside the Victoria Cross as Britain’s highest award for bravery, for “awe-inspiring and humbling” efforts to defuse IEDs in Afghanistan. They include included Staff Sergeant Olaf Schmid who was killed in October last year on what should have been the last day of his tour of duty while disarming his 70th roadside bomb. (TELEGRAPH.CO.UK) Mr Cameron landed in Kabul on an RAF plane before holding talks with Hamid Karzai, the Afghan president. On his first major overseas trip since taking office, the Prime Minister is visiting a country where 10,000 British troops. His visit is expected to form part of the new Government’s review of the mission in Afghanistan, which has lasted almost a decade and cost nearly 300 British lives. Mr Cameron announced extra spending on armoured vehicles and other specialised equipment to protect British forces in Afghanistan from improvised explosive devices. (IEDs). Barack Obama, the US President, has indicated that he wants US numbers in Afghanistan to start falling by July 2011.